ugh! I know I am wrong- but I want a littlle fear in him to remind him what is right and wrong. He is a good/sweet boy. but socially, as they all are, it is like he just does not even care how he acts.... too hard to explain in a short paragraph. I guess I just get tired sometimes of being on edge. and feel inside he knows what is right and wrong. but do I need a reminder that maybe he does not? Luckily we don’t have a problem getting him to eat. It’s getting him to stop eating J Must be the ADHD combined with a big growth spurt. Well, I guess it’s a good thing that he wants to be chef. What about an Asperger's teenager who has no problem eating junk or trying junk (pizza,macaroni,ice cream) but when it comes to fruits and vegetables would rather spend 5 hours at the table refusing even a bite rather than try it??? I'm very grateful for all the wonderful information. I'm curious about messy eating and chewing on stuff....pencils, toys, paper, wood.. you name it he'll put it in his mouth. To James: Good question ...I'll respond to this in the 10/2 post entitled "Aspergers Children and Pica" ...stay tuned! My son was going through an oral phase recently, during which he was chewing on everything in sight. We found him chewy necklaces on amazon, and he wears that around his neck and chews on that if he feels the need to. This way, we provided what he needs for sensory stimulation, and avoided the socially inappropriate behavior of chewing on clothing, toys etc. How do I get my Aspergers son to try healthy foods? I have switched to a raw vegan/vegetarian diet in my house and I can't get him to try different foods. Our family has always eaten a traditional western diet, loaded with processed, packaged, fast foods, high in sugar, salt, fat and meats. He is 14 years old and when I eventually coerce him into trying something, he has his mind already made up not to like it and just gags or spits it out no matter what it is. He won't even drink orange juice! He has an electric toothbrush and I was hoping this would help reduce his sensitivities to textures and/or flavors but it hasn't seemed to help. Any ideas or suggestions would be greatly appreciated. I really want to get the chemicals out of his system. Cathryn Perrotti Larkin i don't even like my foods touching :) my son had portion rules- as he grew to 6 ft tall, he wasn't eating more to accommodate his growth spurt. it took many months to help him adjust to the proper caloric intake- he was skin and bones in the meantime. I love reading or hearing from other more vebal teens. My son has a hard time getting what is in his head out of his mouth - but he loves it when i find these little nuggets of asperger wisdom...It makes sense to me that he can only think of the taste of one food a time. I can't wait to ask him if that is what it is like for him, we are very sucessful at comimg up with plans once we know what his brain is saying and what his desires are saying. I might get a hug for this one! I am so thankful that everyone shares their experiences, so that other families can benefit. Shanna Dawson-Ferguson My son would go rather starve too than eat foods that are mushy. Jessica Swift My daughter is 5 and she would rather starve than eat just about anything. She won't even drink milk-shakes or smothies. Basically she survives on pediasure! i have a 16 yearold and a 4 yearold with aspergers, i am really worn out with all the changes i have to make when they decide that today they dont like what they ate yesterday. my 16 yr old is a little bette now, he will tollorate food he wont eat to be on his plate(just in case he wants to try) and some time he does, but most of the time it end up in the bin. my 4yr old is a nightmare at the moment he has been given 4 milkshakes a day now and only eats bread and butter. well meaning family members try to presure them to eat normaly but this results in major melt downs. and his mood swings are really bad mainly die to lack of food. My son does not like for foods to touch and he hates casseroles where everything is jimbled together. My solution was to seperatethe ingredients and then make him take 2 bites of the mixed food before he can eat the seperated food. My husband finds this ridiculous and infuriating which turns dinner into a nightly war. I don't know what to do anymore.Is my way really that dumb? My son has had a similar limited diet his entire life and is now 10. We continue to struggle adding other foods and choose to pick our battles. He does take vitamins to make sure he gets the nutrients he needs. My son has added a couple of items as he has gotten older. My blessings with your family as I understand the work that goes into becoming the person you need to be for your asperger child. 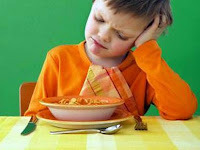 Interesting post about Picky eaters.